The Philippines economic growth rate slowed in the fourth quarter hurt by Typhoon Haiyan, which swept through the country in November. It was one of the most powerful storms ever recorded and caused widespread damage in central Philippines. According to the latest figures, the country's economy grew at an annual rate of 6.5% in the three months to the end of December. That is the slowest pace of growth the country has seen in six quarters. However, the growth rate was better than expected. Many analysts had forecast a figure close to 6%. Krystal Tan from Capital Economics said the figures indicated that the Philippine economy had been "remarkably resilient" to the impact of the typhoon. Typhoon Haiyan hit the coastal Philippine provinces of Leyte and Samar and six central islands. More than six thousand people were killed by the storm, with nearly two thousand more still missing. In the immediate aftermath of the disaster, the country's finance minister, Cesar Purisma, warned that the damage caused by it could reduce growth by one percentage point in 2014. Many economists also downgraded their 2014 growth forecasts, citing the widespread devastation. The World Bank has predicted growth to slow to 6.5% this year before picking up again in 2015. However, the government estimates growth of up to 7.5% this year because of an expected boost from reconstruction spending. 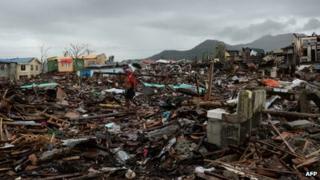 Philippine President Benigno Aquino has pledged to spend billions of dollars rebuilding typhoon-affected areas. Ms Tan said that growth was likely to "remain strong, as agricultural production and manufacturing output in the worst affected parts of the country, namely, Visayas, Bicol and Northern Mindanao, get back to normal". "Reconstruction efforts and foreign aid will also help," she added.